Here is a sneak peek when I was invited by Ms. Merced Adasa (the Marketing Associate of Twinky) to drop by in their boutique at Glorietta 1 Makati. I tried different clothes and shoes. I got to pick the pieces that I am going to use for my next style blog. They have wide range of shoes from flats – heels – boots. They provide shoes for whatever the women’s preference are. Be it in simple and casual, chic, and classy. Their boutique is quite simple with an elegant vibe. The staffs were approachable and accommodating, especially Ms. Jen the Officer in Charge for their boutique in Glorietta. Now turning to the outfit that I wore. I’ve decided to use a collared button-down for my top because I want to look a little bit formal. I still wanted the nice design of my top to be the focus of my outfit that’s why I paired it with a dark toned skorts. I think that the laser cut-out details of my skort made my look more dainty and chic. Lastly to add a glimpse of height , I go with the neautral strappy wedge. 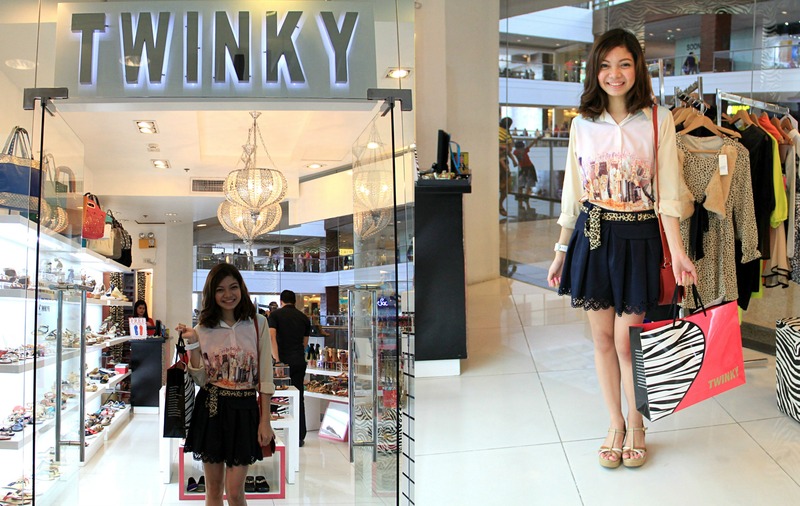 Look out for my Twinky Style blog very soon! Get to know which of these pieces I’ve chosen for the blogpost! If you don’t have time to go out, you can actually still shop for their outrageous items.